It’s a curious thing, the street. You almost can’t say what it is. For sure it’s more than the pavement on which folks walk. Or the blacktop surface on which cars drive. The street really is the coming together of many things. It’s the packed-in tenements or apartment houses in a big city. It’s even the rooftops of those houses. Because folks go up on the rooftops at night to escape the heat of summer. It’s the fire hydrant or Johnny pump turned on, on those hot summer days. It’s the grocery store, schoolyard, dirt lot on a particular block. 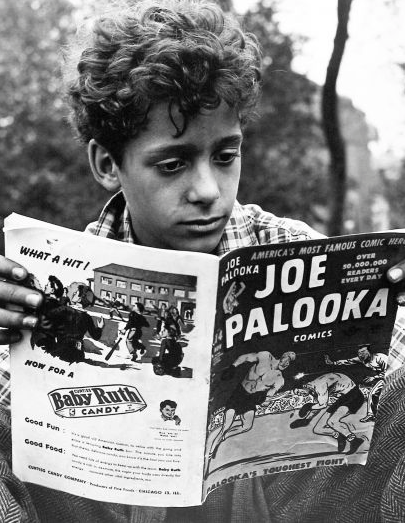 Kids reading comic books or men hanging out on stoops. The street is a whole complex world. In a city like New York it’s a very complex world indeed. And that’s what you see in the photos of the New York Photo League. A vivid street world in a very complicated, big city. 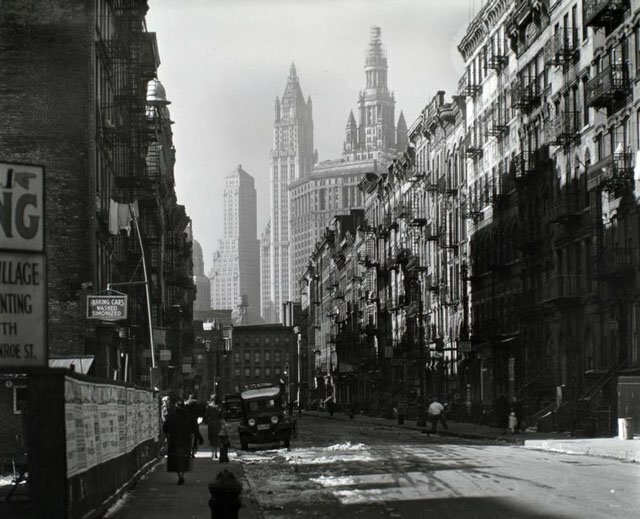 Founded in 1936, the New York Photo League set out to shoot their complicated, stressed-out world. It was the depths of the Great Depression. World War II wasn’t far off. It was a time of hardship and flux. A lot of the League photographers came from impoverished, immigrant backgrounds themselves. So, they were inclined to shoot poverty, the difficult world around them. They also were inclined to shoot the working class. For the working class—along with the poor—seemed to struggle the most. You can say that the League photographers had a social conscience. And they did. But they were not fundamentally political in their approach to their subjects. They believed photography was, first and foremost, an art form. But it was an art form with tremendous documentary potential. And they wanted to unleash that potential. 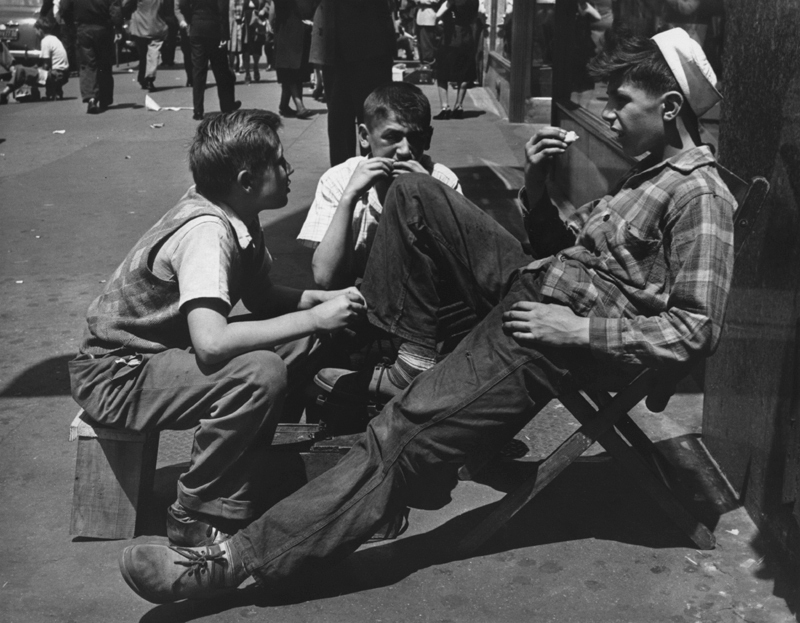 In this respect they were helping to invent street photography as we know it today. 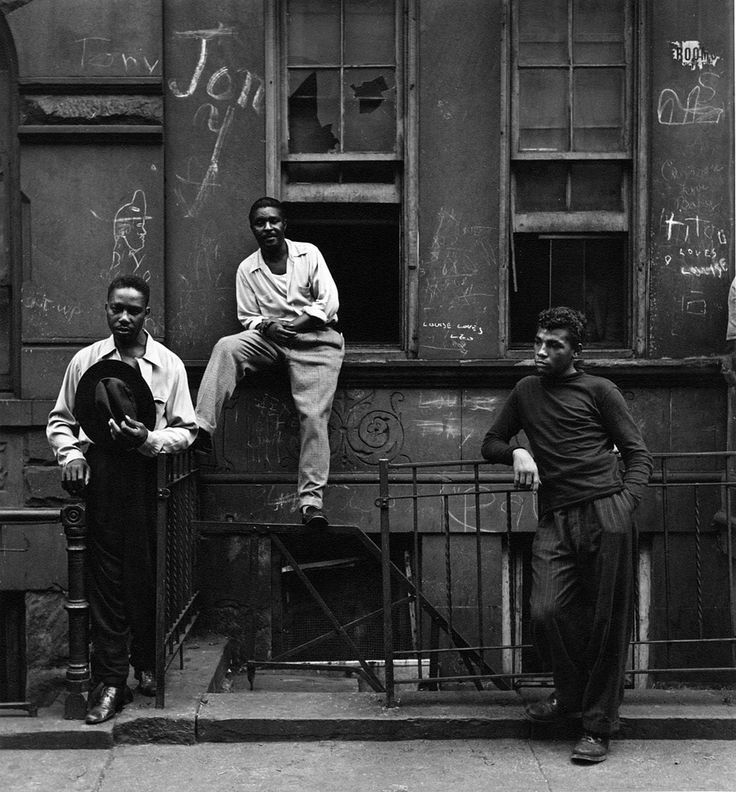 You can see in the photos of Morris Engel, Sid Grossman, Walter Rosenblum, Bereniece Abbott—all represented here—a variety of styles and approaches. For there was no single Photo League style. Rosenblum shot in a spare, poetic, unflinching way. He looked a difficult subject straight on. 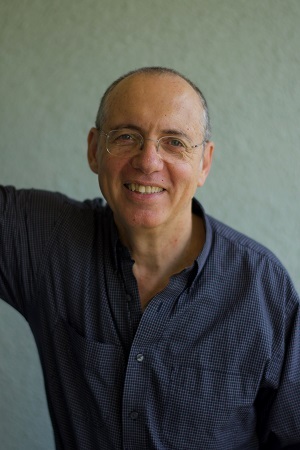 Engel had a more open, lyrical, positive view of the world. 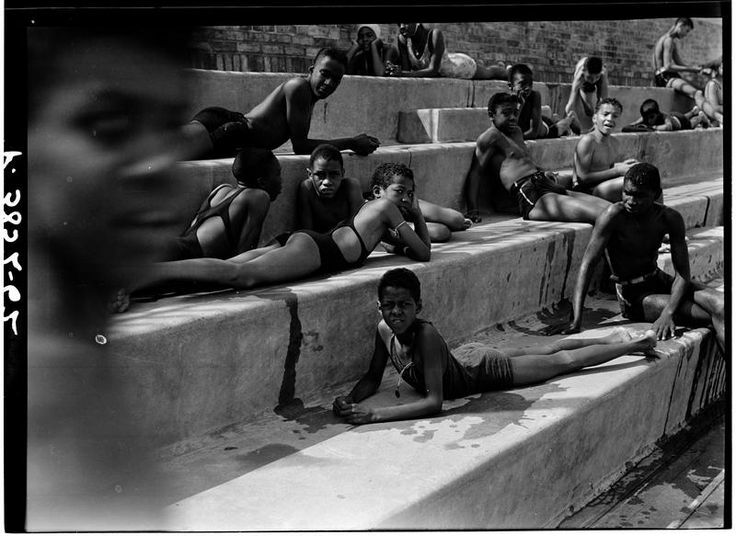 Grossman—as he’s represented here—could shoot straight documentary as he did in his photo of a public pool in Harlem. 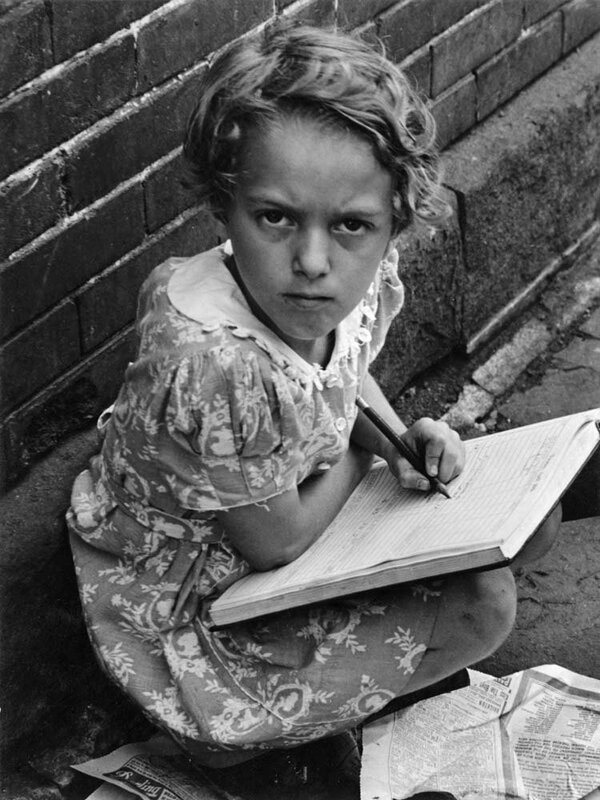 Or he could shoot, straight on, a tight, angry little girl, creating a tense psychological portrait. 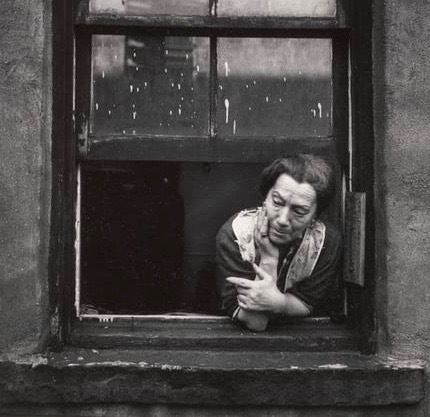 Abbott’s shot of tenement buildings shows her documentary impulse but it’s also strangely evocative. You can almost feel in the old buildings of her photo the ghostly presence of generations of immigrants who came to New York. 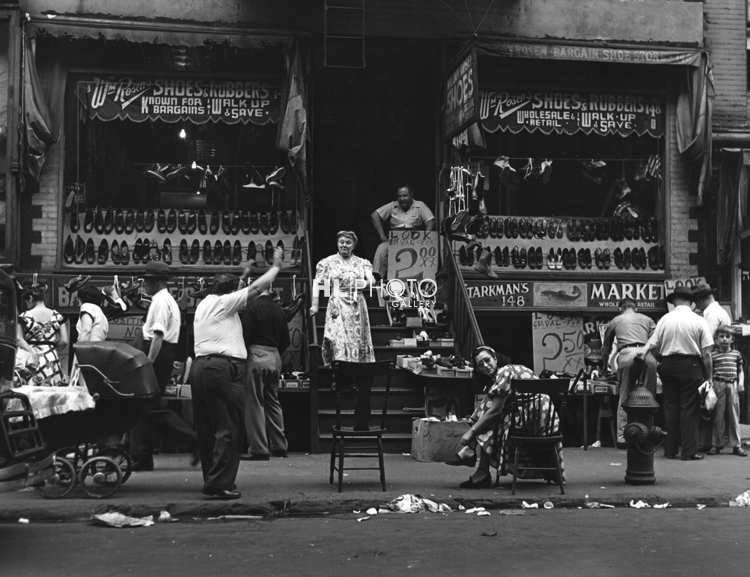 Anyone who has ever walked the lower East side of New York knows even today how palpable that strange feeling still is. Especially late in the day. When the shadows rise up, as they do in Abbott’s photo. 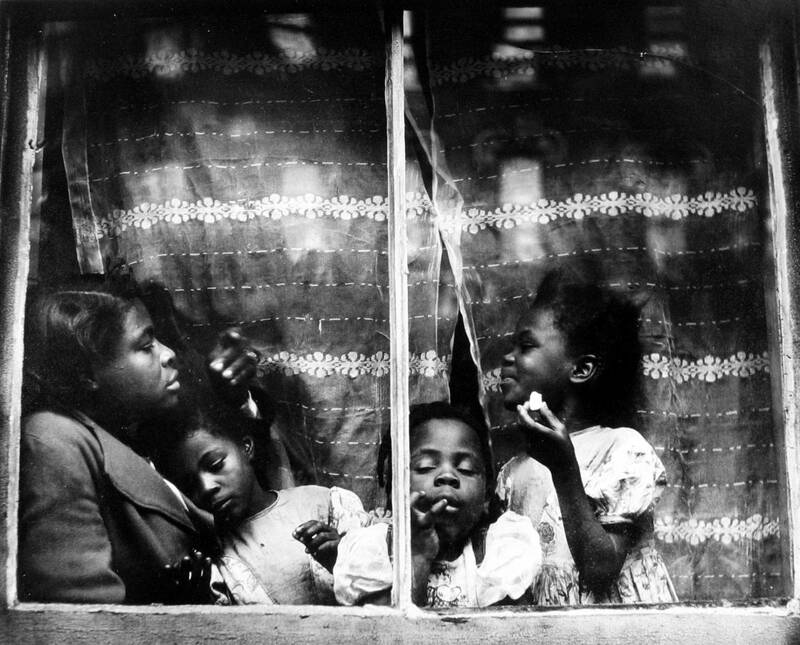 But the shot that had the strongest effect on me is Engel’s photo of an African American mother and her three little girls, pressed against a window. The mom looks tired as she strokes the head of one child. Another girl, holding food, smiles. While the third child closes her eyes. There’s an uncanny sense of peace, I think, to this shot. Even the curtain seems to be protecting them, at least for the moment. This is street photography at its very best, I would say. When it touches the depth of its subject. 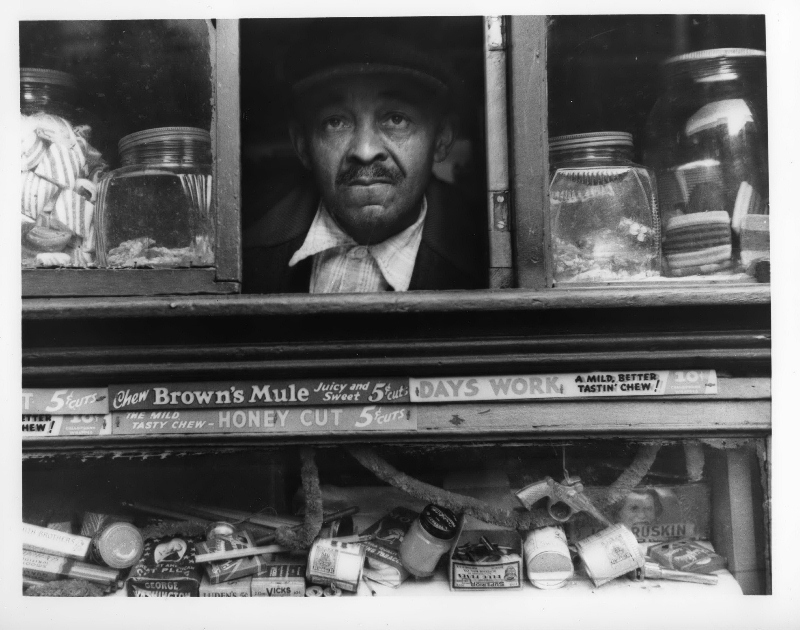 I think we street photographers today can learn a lot from the Photo League. The simplicity of their approach, their urgent desire to tell the truth about difficult subjects—their willingness to experiment with different styles—all this can apply to what we do and how we shoot today. I think the League photos have a power and vividness that tells you good street photography endures. And that alone can be very inspiring. The Duncan Miller Gallery in Santa Monica, California is having a special exhibition of several recently discovered photos by members of the Photo League from now through July 14, 2018. 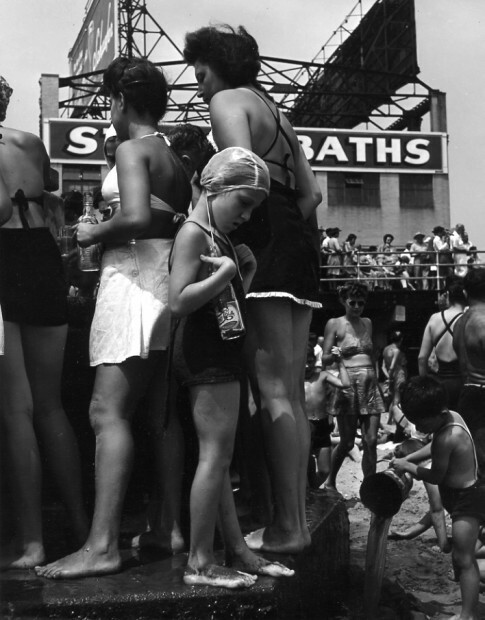 The exhibition will show previously unseen works together with known photographs from Photo League members and friends: Berenice Abbott, Margaret Bourke-White, Walker Evans, Phillip Halsman, Helen Levitt, Sol Libsohn, Ruth Orkin, Ralph Steiner, Weegee, Eliot Elisofon, Morris Engel, Lisette Model, Sid Grossman, Ansel Adams, Richard Avedon, Martin Elkort and others.